Fleas and ticks refer to both parasites and insects that are omnipresent in the environment, commonly affecting dogs and cats. Fleas can play a major role in diffusing parasites such as bacterial diseases and tapeworms and roundworms, which cause discomfort and illness to pets. Ticks are considered to be very harmful for pets, causing transmission of diseases such as Lyme disease. Pets may bring ticks into the human environment, causing illness from a tick bite. Hence there is a growing need to control these pests. There are several repellents, insect killers, as well as growth inhibitors that are available commercially within the market to protect pets from flea and tick bites.The global flea and tick product market is segmented by product type, pet type,and method. In terms of product type, the market is segmented into chewable and spot on. The chewable segment is further sub segmented into fluralaner, valerian, chamomile, and others. Under the spot on segment, the market is segmented into methoprene, fipronil, moxidectin, and others. On the basis of method, the flea and tick product market is segregated into internal and external. Based on pet type, the market is segmented into dog, cat, and others. Increasing awareness of pet care to protect pets from the threat of parasite attacks and itching caused due to fleas and ticks has led to the rising demand for safe and effective healthcare products such as multi vitamin & amino acid supplements, flea and tick products, oral care etc. Consequently, the market for companion pets and animal medication has been witnessing lucrative growth prospects from the last decade. The availability of pet medication has led to the increase in cost of pet ownership, as consumers are demanding these products in order to keep their pets healthy. The industry is characterized by high competition between all the stakeholders of the value chain. As pet owners are provided with several benefits, stakeholders are lowering product prices in order to remain competitive in the industry, thereby providing pet owners with high convenience and improved services. Awareness and repetitive habits of consumers relying on these pet products are expected to drive the demand for flea and tick products in the near future. Additionally, changing consumer attitude toward pets, and product availability through different channels are also major factors that have led to the rise in demand for flea and tick products. On the basis of geography, the global flea and tick product market has been segmented into North America, Europe, Asia Pacific, Middle East & Africa, and South America. North America dominated the global flea and tick market followed by Europe. The rising awareness about proper health and wellness of pets among the population in these regions has resulted in the dominance of North America and Europe in the flea and tick product market. The flea and tick product market consists of a large number of public and private players. The market players focus on developing new products to satisfy the changing consumer preferences. Rise in advancements in technology and strategic acquisitions are the key competitive strategies adopted by the top players. Some of the major players of the flea and tick market are Merck Animal Health (Merck & Co., Inc.), Virbac Corporation, Ceva Sante Animale S.A., Bayer AG, Sergeant’s Pet Care Products, Inc., The Hartz Mountain Corporation, Ecto Development Corporation, Wellmark International, Inc., Merial Animal Health Limited, and Eli Lilly and Company. The report also highlights the competitive landscape of the key players in the flea and tick product market. This report on the global flea and tick product market provides analysis for the period 2016–2026, wherein 2017 is the base year and the period from 2018 to 2026 is the forecast period. Data for 2016 has been included as historical information. 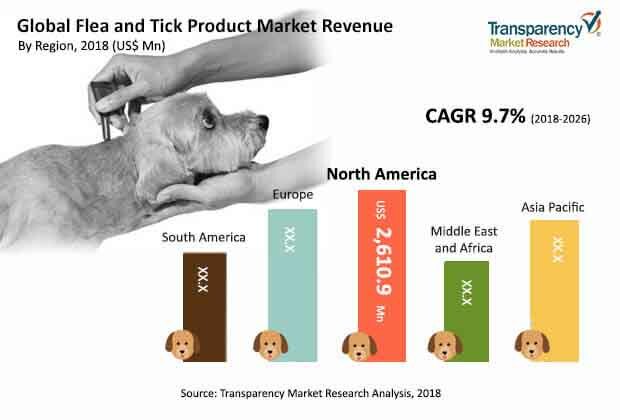 The report covers market dynamics including drivers, restraints, opportunities, trends, policy and regulations, and technology advancement that are expected to influence the expansion of the flea and tick product market during the said period. The study provides a comprehensive analysis on market growth throughout the above forecast period in terms of value estimates (US$ Mn) across different geographies. The global flea and tick market is expected to show significant growth rate during the forecast period due to product availability through different retail channels. Additionally, treating pets as family members has also resulted in awareness about their proper health among the population which is expected to create huge opportunity for the flea and tick product market across the world during the forecast period. Increasing threat of parasite attacks and itching caused due to fleas and ticks has led to the demand for safe and effective care products. Consequently, the market for companion pet or animal medication has been witnessing lucrative growth prospects from the last decade. The availability of pet medication has led to the increase in cost of pet ownership, as consumers are demanding these products in order to keep their pets healthy. In terms of type, pet medication can be classified into prescription and non-prescription medication. Nonprescription medication is also known as over-the-counter (OTC) drugs. The global flea and tick product market has been segmented on the basis of product type, method, pet type, and geography. The flea and tick product market is segmented by product type into chewable and spot on. On the basis of method, the market is segregated into internal and external. Based on pet type, the market is segmented into dog, cat and others Rising concerns about safety and wellbeing of the pets has resulted in rise in demand for flea and tick products globally which is expected to drive the market during the forecast period. In terms of region, the report classifies the market into North America, Europe, Asia Pacific (APAC), Middle East & Africa (MEA), and South America. Asia Pacific showed the fastest growth rate during the forecast period due to the rising adoption of Western lifestyle among the people in terms of keeping dogs as pets. Additionally, rising purchasing power has also resulted in the increase in awareness of health and hygiene of the pets, thus triggering the growth of the Asia Pacific flea and tick product market. The regions have been analyzed in terms of value in the flea and tick product market industry. Furthermore, region wise prominent countries covered in the report include the U.S, Canada, Germany, U.K., France, China, India, Japan, GCC, South Africa, and Brazil. The report also includes key developments in the flea and tick product market. Porter’s Five Force analysis, which identifies bargaining power of suppliers, bargaining power of buyers, threat from new entrants, threat from substitutes, and degree of competition in the flea and tick product market industry, is also included in the report. Value chain analysis which shows work flow in the flea and tick product market and identifies raw material supplier service providers and distribution channels of this industry is also covered in the report. Segment trends and regional trends have also been highlighted. It also covers segment-wise incremental opportunity analysis. Furthermore, the report covers incremental opportunity analysis and identifies and compares segments’ attractiveness on the basis of CAGR and market share index across North America, Europe, Asia Pacific, Middle East & Africa, and South America. The same has also been provided for each segmentation category i.e. product type, method, and pet, in the scope of the study. The report also covers brand share analysis region-wise for flea and tick and heartworm products. The report also includes competition landscape, which includes competition matrix, market share analysis of major players in the global flea and tick product market based on their 2017 revenues, and profiles of major players. The competition matrix benchmarks leading players on the basis of their capabilities and potential to grow. Factors including market position, offerings, and R&D focus are attributed to companies’ capabilities. Factors including topline growth, market share, segment growth, infrastructure facilities, and future outlook are attributed to companies’ potential to grow. This section also identifies and includes various recent developments carried out by leading players in the flea and tick product market and major brands of players in the flea and tick product segment. Company profiles of players operating in the flea and tick product market include company overview, major business strategies, and key developments. The companies profiled in the global flea and tick product market include Merck Animal Health (Merck & Co., Inc.) (U.S), Virbac Corporation (Carros, France), Ceva Sante Animale S.A. (Libourne, France), Bayer AG (Leverkusen, Germany), Sergeant’s Pet Care Products, Inc. (Omaha NewYork, U.S), The Hartz Mountain Corporation (New Jersey, U.S), Ecto Development Corporation (Blue Springs, Missouri U.S.), Wellmark International, Inc. (Naperville Illinois, U.S.), Merial Animal Health Limited (Ingelheim, Germany), and Eli Lilly and Company (Indianapolis, Indiana U.S.). The report also offers competitive landscape of the key players in the flea and tick product market.